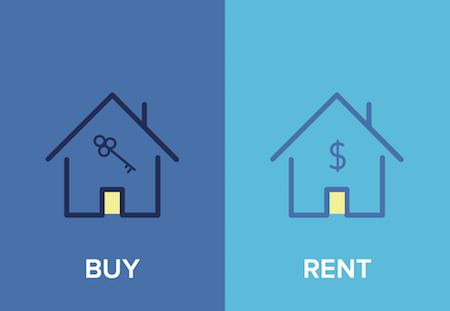 HomeWisdom guide: Buy a house or rent it? To buy a house or to rent it is one the biggest financial decisions which many young families face in today’s time. Age old conventional wisdom was to buy a house as soon as you can as owning a house was considered a good investment. Not only did one look at buying a house as an investment decision but also an emotional one on becoming a proud homeowner which provided a sense of achievement. But now looking at the high real estate prices, especially in bigger cities, the decision to buy a house needs to be evaluated with much more financial prudence than ever before. Real estate, no doubt, is a good investment option, but since it involves the huge amount of capital and is a relatively illiquid asset, many aspects need to be considered before you invest in it. Hence, before arriving at the decision to buy or rent a house you have to evaluate the pros and cons of both options taking into account your own situation. It is not an easy choice and there is no one size fits all approach. Financial Security: Lower interest rates, ease of home loans and tax benefits have made owning a house much easier and financially viable than ever before. However, you must also evaluate your own financial position before arriving at the decision. At the time of buying a property, you need to pay upfront money in the form of down payment and the financial institutes provide loans for the remainder 80 to 85% of your fund requirement. You must have sufficient funds available to make the down payment at the time of buying a house. Apart from this, once your housing loan EMI starts, then every month a portion of your income will go towards payment of EMI. You must ensure you will be able to cover all your expenditure, pay the EMI and have some savings for future contingencies. If you feel you are financially secure and fulfill the above minimum requirements, you can buy a house. Otherwise, it is wiser to defer the decision of buying a house for a few years and renting out is a better option for you. However, if you are able to afford the EMI, a home loan is one of the only loans which is a “good” loan, wherein your credit rating improves on availing this loan and paying the EMI on time, there are tax benefits associated with this loan, etc. Hence, if you want financial security as a part of your portfolio, real estate is a great option and home loan is worth taking! Future earnings prospects and job security: Home loans are long-term contracts and you need to pay your housing loan EMIs for a very long time. If you are looking at switching your job or do not have a stable job, you will be better off renting a house. Buying a house makes sense if you have a stable job and your salary is likely to increase in future. Long-term goals versus short-term goals: Buying a house is a long-term goal whereas there are many goals which need to be fulfilled in the near future such as paying-off old debts, starting a family etc., it would be wiser to stay in a rented accommodation. Buying a house is a long-term commitment and should only be availed once your career is stable. Freedom of Mobility: If you have just started out in the corporate world, you may want the flexibility to move to other cities because of better job opportunities and growth prospects. In such cases, it is better to stay in the rental accommodation. Buying a house is a good option only if you intend to stay in the same city for at least 10 years. Alternately you could even earn rentals from your property. Rental yield in India is not as high as developed economies, but it surely is quite a stable asset to possess! Price of property versus rental value: Apart from your financial strength and future prospects, another crucial factor is the price of buying a property versus the rent. In many big cities, real estate prices are high and so is the rental. So, if you consider renting a property, weigh the same vis-à-vis the property you could have opted for if you had chosen the home loan route. In that case, instead of paying rent, you could own the house and in 20 years, the entire property would become EMI free and then add value to your overall portfolio. Rent may just continue to burn a hole in your pocket with no return! Ease of disposal: Buying a house involves a huge amount of capital. Many times, we get lured into buying a house in far-off remote areas which do not have adequate infrastructure thus disrupting our day to day life. Good infrastructure not only provides capital appreciation but also ease of disposal. If you choose to buy a house, ensure that it has adequate infrastructure, otherwise, one wrong decision can leave you with an illiquid asset and huge amount of debt. Hence, the decision to buy or rent a house should be a holistic one and taken after carefully evaluating each and every parameter.